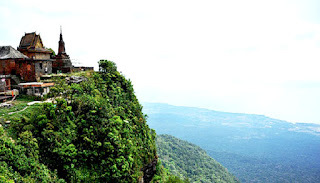 Kampot Province is well known with durian, pepper and the famous destination named Bokor Mountain and Bokor Hill Station. The province is one of the meaningful places for tourists in Cambodia because there are the ruins in French colonial time and many sacred places to visit. Kampot Province is located to the south of the city. It has the convenient road for travelling. Districts: The main town in Kampot province is Kampot town and there are 8 districts in this province. The districts are Angkor Chey, Banteay Meas, Chhuk, Chum Kiri, Dang Tong, Kampong Trach, Kampot and Kampong Bay Districts. Climate: Kampot province has its own climate in Cambodia. It is cooler than other provinces by the location. There are the big gap between the night time and day time about its degree. The rain time in this area is from May to October. The dry time is from November to March. The average temperature is 27 C degree. Transportation: Travel conveniently by land and airline to the city and from it to other provinces. Bokor Hill Station: the well known destination is located in Bokor Mountain. It is far from Kampot center about 10 km to the southwest. There are many things for visitors who can explore here. They are the ruins of the French Colonial Time and the new things were built to serve tourists. Teuk Chhou Spring: the wide spring is with calm and nice natural picture. It is far from Kampot center about 15 km. This is one of the popular destinations in weekend for tourists. Kampot Town: exploring the crowded town with the local active business life is the interesting point in Kampot. Especially in here you can find the world of durians and some other local fruits. Phnom Chnok: this is the classification nature wildlife and preserves place. This is the great place for tourists who explore the rich nature and many impressive landscapes. The destination is located far from Kampot center nearly 10 km. Phnom Daung: the other value nature wildlife and preserves of Kampot. It is located far from the town center about 7 km. It belongs to Treuy Koh Commune in Kampong Bay District. Rabbit Island: the small island with pure space. It is located far from Kep Town about 40 minutes by boat. Rabbit Island is usually the destination that combined in the trip in Kep town in day. It is the interesting place for tourists to explore. And there are many other famous destinations in the cities. Independence Day: the event is happened in 09 November each year in Kampot and all provinces in Cambodia. Victory Day: the event is happened in 08 January each year in Kampot and all provinces in Cambodia. .
Khmer New Year: it is happened from 13 April to 16 April in Kampot and all provinces in Cambodia. And there are many other unique festivals and events in the province. There are different local specialties in the province such as fried crab with local pepper, seafood, durian, lemon, and other typical specialties.